Aunty Eight’s Vietnamese is an oriental inspired eating place with a focus on traditional Vietnamese culture and communal dining. 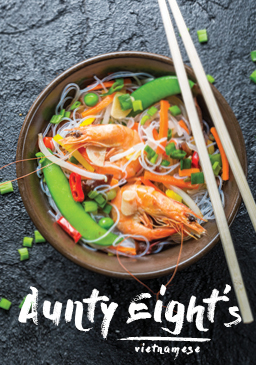 Aunty Eight’s architectural design and menu originates from authentic Vietnamese street food produced in a theatrical open view kitchen. The name Aunty Eight’s stems from the Vietnamese traditions of family and food inherited through the generations. The Aunty in Vietnamese culture is an affectionate term that embraces qualities of nurture, care and warmth. The Aunty is also identified in numbers rather than name, which brought about the word Eight. The number Eight is a sign of good luck, wealth and prosperity and is the name children would call an Aunty in many Vietnamese families. Hence the name, Aunty Eight’s Vietnamese. Aunty Eight’s resembles the culture of Vietnam in its graphic art and communal seating. The graphic circular art floats freely on textured walls and thin copper pillars backed with warm lighting; exhibiting Vietnamese landscapes and traditional customs. Aunty Eight’s features long tables, high stools and metallic wall length seating for a communal feel. The seating is inspired by a Hawker Centre or cooked food centre where authentic Vietnamese street foods are created in stalls with adjacent common shared or stall dedicated tables and chairs. The open view kitchen at Aunty Eight’s is a window into Vietnamese culture where animated chefs create authentic dishes, just like those made at a Hawker Centre. The wide open view kitchen brings the traditional street food experience to the dining room with aromas of fresh herbs, meat, seafood and spices. 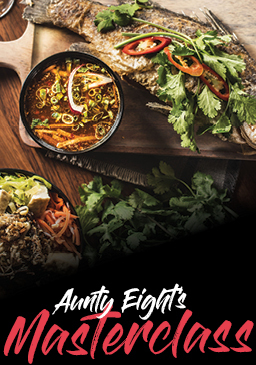 Aunty Eight’s Vietnamese has been established with the vision of traditional Vietnam culture and is an exceptional and unique eating place that takes guests on a cultural food journey through Vietnam.